Wat Pho, or Wat Phra Chetuphon is famous for the huge Reclining Buddha statue, over 46 meters long and 15 meters high . At 20 acres large, it is the largest Wat in Bangkok, and is technically the oldest too, as it was built by the people in the reign of King Petraja of Ayutthaya in 1688 before Bangkok became Thailand's capital. The Reclining Buddha was built in 1832 in the reign of King Rama III. 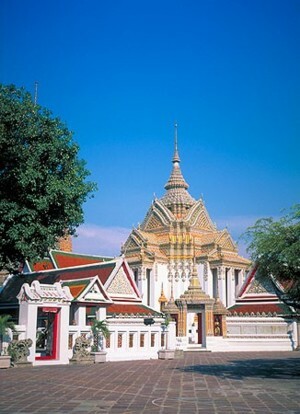 Wat Pho is the center of public education and is sometimes referred to as Thailand's First University. The temple is also the center for traditional medical practitioners in Thailand. Stone plaques and inscriptions describe treatments for various ailments and methods of massage and meditation. Snake handlers also have their businesses there.